Sichuan:Danba Xian. SW of the city of Danba on road (highway 303) to Kangding and Daofu at Maoniu Cun along Maoniu He (Maoniu River). Mixed coniferous forest of Tsuga, Abies, Picea and Pinus with scattered trees of Salix (along river), Betula and Prunus. 30°42'21"N, 101°45'9"E; 2880-2920 m.
Sichuan:Danba Xian. SW of the city of Danba on road (highway 303) to Kangding and Daofu at Maoniu Cun along Maoniu He (Maoniu River). 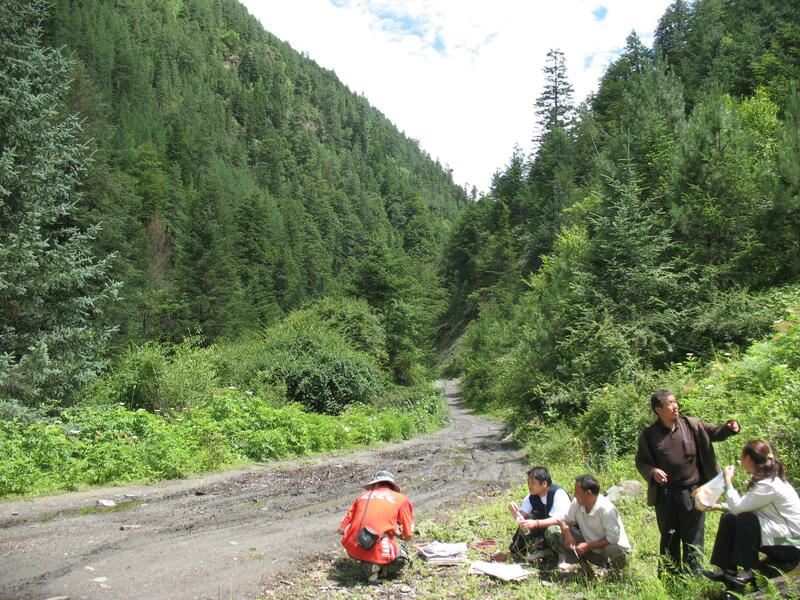 XU Bo (preparing specimens) and forestry personnel.